Aloe vera is a commonly found ingredient in skin care products today but if you are looking for the best aloe vera moisturizing cream for face, you will want a higher percentage of aloe vera included in it combined with some other quality natural ingredients that will work synergistically with aloe and will boost aloe vera positive properties even more. 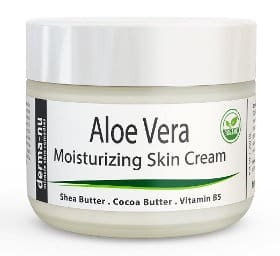 If you are not so much into DIY aloe vera skincare recipes or you don´t have your own aloe vera plants which you love taking good use of them, then buying an aloe vera facial cream which is good to moisturize and heal your skin resulting in more hydrated and smoother feeling skin is a good idea. Here, I have selected some good quality aloe vera face creams that are also quite popular and giving you detailed reviews of all of them to be able to find out yourself which suits you best. 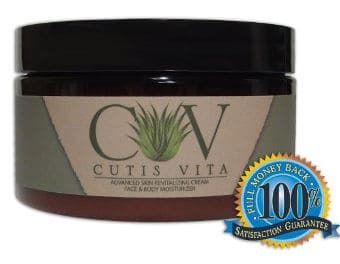 This Cutis Vita Skin Care Aloe Vera Cream comes in a 4 ounce container and is free of artificial fragrances and parabens. According to the manufacturer, it has a high concentration of aloe vera and contains some other good natural ingredients such as Shea Butter, vitamins A and D3, Macadamia Oil, Rosehip Oil, Ginseng root, Green Tea and Chamomile. 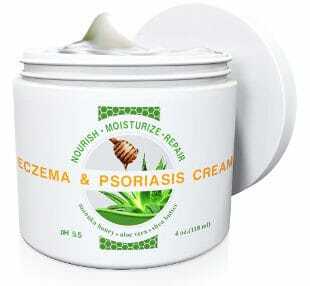 The company claims that this cream is good for dry itchy skin to relieve it as well as nourish and hydrate it. It does not irritate sensitive skin and it is overall good for making your skin softer, smoother and younger looking. It also helps reduce scars and tighten pores. It absorbs fast, does not leave any oily residue behind and has a fresh scent. It is suitable for both day and night use, made in the USA and followed by 1 year full money back guarantee. If you buy this aloe vera cream, you will get a travel size of this cream as a gift. Reviews for this skin cream are very good. Users say that it has a nice thick texture, goes on smoothly and absorbs quickly. They like it because it is non greasy and leaves their skin feeling soft and smooth. It helps to diminish fine lines and works better on dry skin than on oily skin. It is also excellent at healing chapped dry skin on face or on hands. The Derma-Nu Miracle Skin Remedies Aloe Vera Dry skin cream comes in a 4 or 8 ounce container and, according to the company, it is suitable for dry skin, irritated, itchy, cracked or red skin, as well as cases of eczema, psoriasis and sunburned skin. It is generally good for deep hydration, restoring the skin´s natural moisture as well as providing the skin with anti inflammatory benefits that can help against the process of aging. It is packed with natural skin healthy and healing ingredients such as organic Aloe Vera, Vitamin B5, Shea Butter, Calendula, Cocoa Butter, Jojoba oil, Organic Green Tea and Evening Primrose. The only thing I would comment about its ingredients is that since it contains Beeswax, it is not suitable for oily or acne prone types of skin since Beeswax can clog the pores. Also, this aloe vera product is made in the USA and is 100% money back guaranteed. Users give this product very good ratings. They find that it goes on smoothly, absorbs quickly and is not greasy. It does wonders at relieving sunburn pain and leaving their skin feeling smooth and silky. People like the wide mouth jar and several of them use this product as a night cream stating that when they wake up in the morning, their skin feels hydrated and healthy. Users also do feel that it works best for dry rather than oily skin. 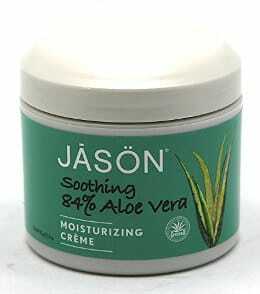 The Jason Natural Ultra Comforting Aloe Vera Crème is the only cream in this review that the percentage of the aloe vera gel contained in the formula is clearly mentioned and it is 84% of aloe vera gel. So, this is a rich concentrated yet light emulsifying aloe vera cream that contains some other good quality natural ingredients such as sweet almond oil, vitamin E, sunflower seed oil and others. 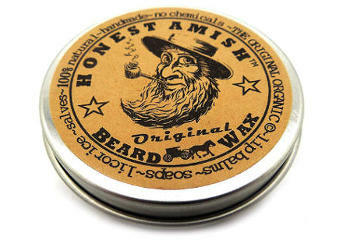 It is free of harsh chemical preservatives, comes in a 4 ounce container and has a good price. I have been using Jason Vitanin E Cream and I can say that I am very pleased with its quality and effectiveness, so the quality of Jason aloe vera cream won´t be different, I suppose. Reviews for the Jason Aloe Vera Cream are exceptionally good with users finding that it not only makes an excellent moisturizer but that it also helps to relieve the itch from conditions such as shingles or eczema. It goes on smoothly, absorbs quickly and really hydrates leaving your skin feeling smooth and soft. Several users have stated that it actually soothes itchy dry skin. 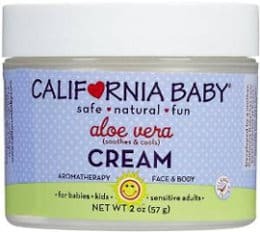 This California Baby Aloe Vera Cream is an organic cream that can be used for newborns and can be used as a year-round moisturizer for all ages. This ultra hydrating cream is designed to soothe, calm and cool skin after sun exposure or beauty skin treatments. According to the company, it is a non greasy moisturizer that can be used on its own or under makeup. Due to its healing and soothing properties, it is also recommended for eczema, rosacea, stretch marks, just shaved or waxed skin as well as sunburned skin and scars. It is made mostly of Aloe Vera infused with various herbs and essential oils to add to your skin´s health. Users say that this product goes on extremely smoothly and absorbs deep into the skin quickly. Some of them state that it does not have the greatest smell, but it is non-oily and helps hydrate dry skin and clear up rashes quickly. They also like the fact that it feels natural even on sensitive skin. 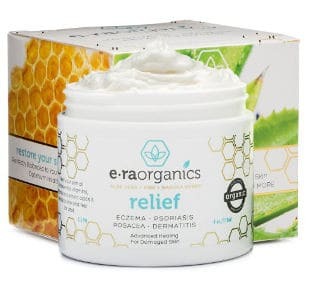 The Era Organics ¨relief¨ Cream is designed to help treat a large number of sensitive skin conditions such as Eczema, Psoriasis, Dermatitis, Rosacea, Shingles as well as dry, cracked itchy and scaly skin, however it is also a moisturizing facial cream safe for every skin type and even kids. It is free of fillers, parabens and fragrance and the company suggests that it is a fast absorbing cream that will keep your skin deeply hydrated for 12 hours without leaving it greasy or clogging the pores. The company recommends that it can be used on face as well as feet, hands and any other part of the body you need. It comes in a 4 ounce container and includes a number of healthy ingredients including, but not limited to organic Aloe Vera gel, Manuka Honey, Blue/Green algae, MSM, Shea and Cocoa butter as well as vitamins A, B5, C, E.
By checking the full list of the ingredients, I found that this cream contains Phenoxyethanol which is a mild preservative that can be irritating for very sensitive skin types. It also depends on the amount of this preservative used in each formula since a low percentage of it is considered safe. Taking into consideration that this preservative appears in the end of the list and the product is recommended for sensitive skin types, my idea is that it might be ok, but still if your skin is very sensitive, I would recommend that you pay a bit more attention to the ingredients. The Era Organics Relief Cream is made in the USA and is backed by a 60 day money back guarantee. Users give this product quite good ratings stating that it does help to relieve the pain and itching of Eczema for many people. 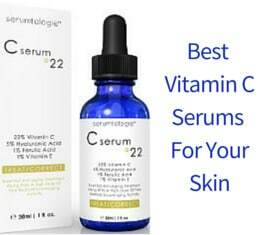 They generally mention that it makes their skin look and feel amazing. It helps to heal dry cracked skin including that on the heels, feet and elbows. It absorbs well and leaves people suffering from Eczema feeling their skin not only softer and less dry and flaky but also smooth and healthier. The Wild Naturals Eczema & Psoriasis Cream contains exactly the same ingredients as the previous cream and claims to be able to deal with similar skin conditions such as dry skin, eczema and psoriasis as well as minor burns and wounds, diaper rash, athlete´s foot and others. It comes in a 4 ounce container, with a full money back guarantee and is free of alcohol, parabens or harsh chemicals. 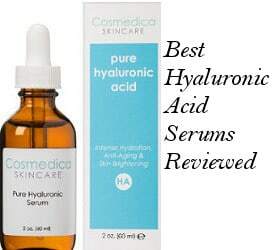 Users say that this is a good facial moisturizer as well as treatment for certain skin conditions. It goes on smoothly and absorbs quickly. Most people state that it eases redness and inflammation from eczema as well as stops itching. However, it doesn’t seem to work well for all eczema sufferers. All in all, Aloe Vera creams can help your skin be hydrated as well as provide temporary relief for a number of different dry skin conditions. Finding the best Aloe Vera moisturizing face cream for you may take a little trial and error, but is well worth it in the end.